In the early 2000’s, I undertook a project to help the Jumano Apache Indian Tribe in Redford, Texas. The tribe has seen a decline in population on the reservation because the government refused to allow them to have a school for their children. The closest school was 80 miles away and parents found the trip too difficult to make and manage work. It was an concerted effort by the government to force Native Americans off of their reservation to be closer to the school. By moving off of the reservation, the government was moving to seize reservation land as no longer occupied. The problem has been going on for years so I immediately contacted the congressman covering the area who was ambivalent to their plight and unwilling to help. 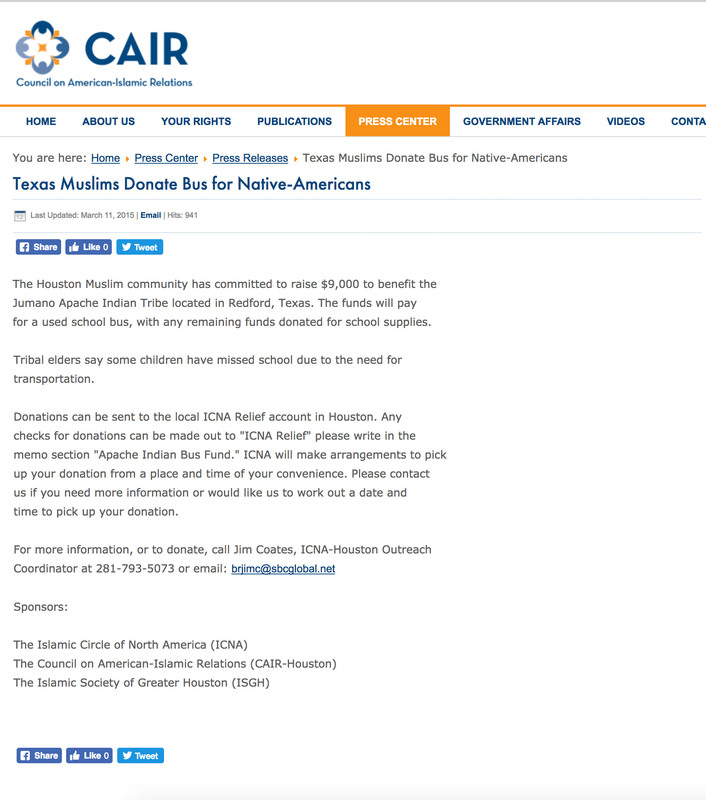 As head of the Whyislam campaign project in Houston, Texas, I organized the group to locate a school bus and I held a number of fundraisers in the Muslim community to purchase the bus. We raised the money, purchased and delivered the bus to the tribe to alleviate the burden on the parents and assist in their struggle to stay on their land and prevent government seizure. CAIR was kind enough to assist us and sent out this release.